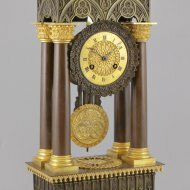 #7185 Brass casted french portico mantel clock in gothic style. 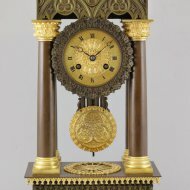 Antique french brass casted french portico mantel clock in gothic style, a style that only lasted a short period (ca. 1835-1845). 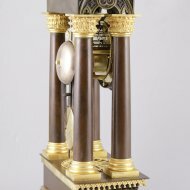 The sharp casted brass is partly fire-guilded and patinated in the 2 colors brown and green. 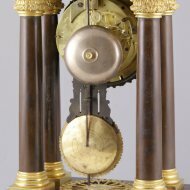 The engaged dial plate i guilder and has Breguet hands.